Anna returned to the U.S. yesterday so on this Sunday morning, Ken and I awoke with a sunny day in front of us and decided to rent bikes on Velib and ride to the street market on Rue Cler. 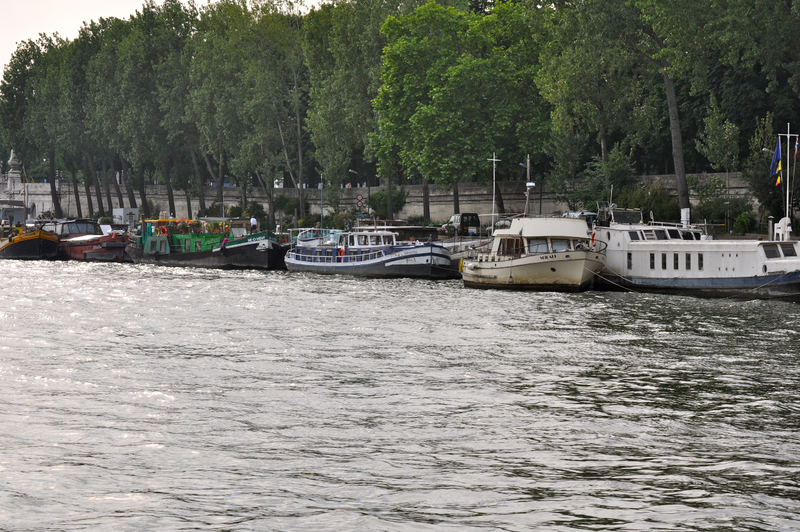 Sundays are my favorite days to rent bikes in Paris because there’s less traffic, and the road along the Seine is closed to cars and open strictly for pedestrians and bikes. 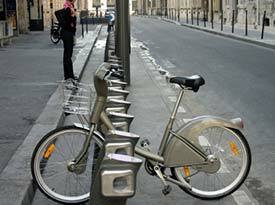 Velib can be tricky the first time you use it but with patience it is a very easy way to rent bikes. Be sure to check out the condition of the bike before you take off with it. The first bike Ken had was stuck in first gear and the seat was broken so we had to return it and get a new one. The first half-hour is free so it wasn’t a problem to exchange. 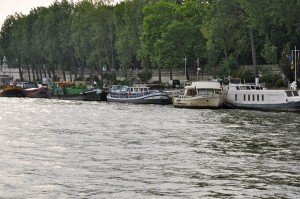 We rode past the houseboats on the Seine, some of them are private residences and some are commercial ventures offering dinner and some providing guided tours. Near the Eiffel Tower we merged back onto street traffic before turning onto a tree-lined path at the Champs de Mars. It was a typical Parisian Sunday with families were picnicking, mothers pushing babies in strollers, children riding bicycles. Nearby we turned onto Rue Cler for the outdoor market. It was nearly 1:00 p.m., late for the market as stalls were being packed up. So we locked our bikes to a post and took a seat in the shade at the Market Café. Our lunch was superbe: Ken’s organic eggs benedict with lean bacon strips had the best hollandaise sauce I’ve ever tasted. My caprese salad was prepared perfectly with the tomatoes arriving whole, seeded and peeled atop a chunk of mozzarella with basil aioli drizzled over them. The bicycling sounds like fun, but your lunch at the Market Cafe sounds fantastique! I’m loving these stories about your Paris adventures.